American scholar Tom Cohen, whose areas of expertise include literature, cinema and cultural studies, gained international reputation with the publication of his first monograph, Anti-Mimesis from Plato to Hitchcock (1994). In this path-breaking work, Cohen not only pointed out the regressive effects of the then prevalent theoretical debates about the limits of representation; he staged a productive intervention into the existing literary scholarship. He restored the role of close reading and reclaimed the centrality of the “materiality” of language and the text, and he did so through an application of a complex and compelling methodological framework, which continues to inform his more recent work. Ever since Anti-Mimesis, a distinctive blend of Nietzsche, Bakhtin, Benjamin, De Man and Derrida, with an occasional dash of Deleuze and Lacan, has characterised Cohen’s deconstructive forays into the canons of Western literature and cinema. To anyone familiar with Cohen’s work, a two-volume monograph dedicated entirely to the films of Alfred Hitchcock should not come as a surprise. The traces of a desire to offer a comprehensive study of Hitchcock’s work have always been discernible in the books Cohen has authored or edited. All of his publications contain numerous references to Hitchcock, many of them developed into substantial chapters on the famous filmmaker. Yet Hitchcock’s Cryptonymies does represent a novelty in Cohen’s curriculum vitae; with Secret Agents and War Machines, the two volumes of Hitchcock’s Cryptonymies, Cohen has finally shed the reluctance to enter fully into the arena of cinema studies. Thomas Leitch, the author of The Encyclopedia of Alfred Hitchcock (2002), which garners a less than favourable mention in Cohen’s Secret Agents, has described the first volume of Hitchcock’s Cryptonymies as a “ferociously original” work. And this is indeed, obviously, Cohen’s intention. From its opening pages right through to the end, Secret Agents is consistently, yet mainly rhetorically rather than argumentatively, produced as a radical double intervention/departure – as an attempt to reconsider the auteurist preoccupation with Hitchcock and his “signature”, and as an even more ambitious attempt to propose a fundamentally different historicisation of Hitchcock. The first objective of Cohen’s project is captured perfectly in the very title of Volume 1. In Cohen’s own words, “secret agents” refer to “more or less ‘secret’ visual elements, graphic riddles, letteration, and cryptonymies that traverse all of [Hitchcock’s] works, linking each to each in perpetual if active interface” (p. xi). The author sees them as radically different from the notion of signature invoked in authorship studies: not only are these elements “secret”, that is, often imperceptible, elusive and, as a result, insufficiently theorised; they are also, literally, “agents”, which sabotage any traditional notion of the auteur. In contrast to the recurrent and clearly demarcated constituents of Hitchcock’s signature, which are said to perform the function of authorial self-inscription and which have been fetishised ad nauseam in the traditional auteurist studies, Cohen’s “secret agents” (aka cryptonymies) are stylistically less ostentatious and semantically less overdetermined, yet ubiquitous. According to Cohen, the textual persistence of Hitchcock’s cryptonymies and their concurrent critical invisibility reveal the spurious logic of auteurist studies; they testify to the fact that what we call “Hitchcock” is a product of selective and contingent scholarly discourses rather than a definitive, complete and empirically verifiable manifestation of a cinematic genius. What this means in practice is that any “glossary” of Hitchcock’s favourite motifs, themes and so forth is necessarily incomplete, relative to the reader and therefore arbitrary. “Secret agents” lurk in between the lines of such a glossary, awaiting another viewer with a different interpretive sensibility. Such a claim is of course compelling, albeit somewhat obvious in the wake of poststructuralism; yet Cohen follows it up with a bizarre gesture. In the second chapter, titled “A User’s Guide to Hitchcock’s Signature Systems”, he offers, no less, yet another glossary of this kind. Despite the dubious disclaimer – “If one pretended dutifully to assemble a ‘glossary’, nonetheless, these recombinant markers could include…” (p.49, emphasis mine) – Cohen here undercuts the legitimacy of his preceding, laboriously-produced theoretical claim. Having said this, Cohen’s inventory of Hitchcock’s “secret agents” is nevertheless enlightening. The usual suspects (birds, eyes, mothers, staircases, windows and so forth) are accompanied by a substantial number of far less predictable entries, all of which feed into the second objective of Cohen’s study. With terms like “blindness”, “B.M.” (the initials on young Charlie’s ring in Shadow of a Doubt , John Hodiak’s tattoo in Lifeboat , the acronym standing in for both the British Museum and Blackmail ), “Egypt” (various Egyptian motifs, “echoing (and surpassing) analogy of cinema to hieroglyphics” [p.54]), “Mar-“ (“a countersignature […] that locates a nonvisible order upon which all visual effects are projected, conjured or (blindly) misidentified: Marlow, Marvin, Mary, Marnie, Marion, Margot…” [p.58]), Cohen not only confirms his career-long fascination with visual and aural puns in literature and cinema; he deftly illustrates his key argument that Hitchcock’s “œuvre assaults ocularcentrism in all its extensions” and “plot[s] sabotage at the heart of modernity’s archive” (p.xvii). Drawing attention to the critically neglected pictographic, typographic and acoustic materiality of Hitchcock’s films – the Derridean traces which evade the representational models of meaning imposed by auteurist criticism – Cohen produces a radical challenge to the established perception of Hitchcock as a typically modern, painterly filmmaker. Instead, Cohen recasts Hitchcock as an iconoclastic, self-plagiarising and logophilic genius prefiguring cinematic postmodernity. Cohen’s book is an original and, indeed, ferocious incision into the body of critical work on Hitchcock as well as on cinema as a quintessentially modern medium. It certainly departs from the traditional ways of reading Hitchcock’s work and it does make a compelling case for a revision of the epistemological and ontological assumptions undergirding the history of cinema. Yet Secret Agents leaves the reader – at least the one writing this review – utterly frustrated. Cohen fails to initiate his readership into his theoretical framework, somewhat presumptuously relying on our familiarity with his methodological preferences, which he has laid out more successfully elsewhere. Furthermore, his pronounced flair for awkward neologisms (such as “deauratic”, alluding to Benjamin’s notion of aura) interspersed with rather obtuse bombastic phrases (like cinema as “a weapon of mass (de)construction”) hardly alleviates the confusion; Cohen’s dictum produces in the reader a rather severe case of logophobia, which, ironically, is what theorists like David Sterritt (The Films of Alfred Hitchcock, 1993) have, somewhat prematurely, associated with Hitchcock and what Cohen tries so hard to dispel. More importantly, Cohen’s project also falls short of expectations precisely on the fronts it self-professedly sets out to challenge. It has been decades since the auteur was last seen so alive and well as in Cohen’s book; the binding agent of Secret Agents is the aura of Hitchcock rather than any kind of a sustained film analysis, for Cohen darts fitfully from one film to another without elaborating or pondering upon the implications of his interesting yet terse observations. And finally, and most disappointingly, I am irrecoverably bemused by the fact that the most recent exploration of Hitchcock, which purportedly sets out to put things right as regards the historicisation of this filmmaker, would be so utterly ahistorical and so lacking in any consideration of the cultural and geopolitical trajectories of Hitchcock’s career. While Cohen has plenty to say about Hitchcock’s awareness of his – and cinema’s – role in the emergence of a global media culture (which nevertheless remains a rather vague concept in Cohen’s study), he does not stop to consider the implications of, say, Hitchcock’s migration from the UK to Hollywood. Is it really so difficult to imagine that the exilic experience of this English-speaking filmmaker in the equally English-speaking, yet culturally fundamentally different capital of the American film industry also had something to do with Hitchcock’s penchant for language games, his fascination with the deceptive power of images and his excessive delight in the fluidity of meaning? 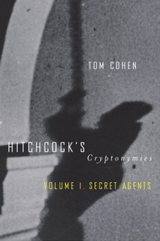 Hitchcock’s Cryptonymies, Volume 1: Secret Agents, by Tom Cohen, University of Minnesota Press, Minneapolis, 2005.